In the age of social media and having constant access to anything we like, I've been finding it increasingly difficult to switch off at night. I'm definitely guilty of turning my laptop off only to play on my phone for an hour and scientists say that before you go to bed at night you should have around an hours rest without looking at any form of electronic device like a phone or laptop. I find this an incredibly hard rule to stick to which is probably why I have such difficulty switching off at night. 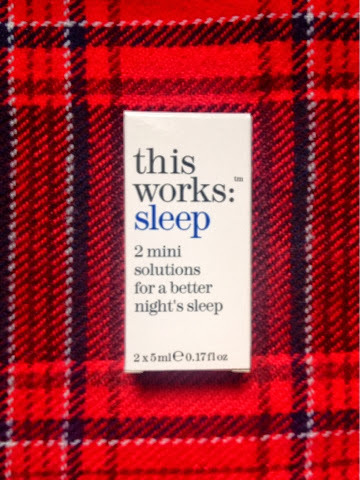 When my boyfriend and I were in Paris our room came with this little sample of This Works Sleep duo which I've since been using almost every night since coming home. It may be entirely physiological but I find the calming scents of lavender and eucalyptus incredibly soothing when trying to doze off and as a result I've found it much easier to switch off and have a great night’s sleep. I know that a number of companies produce these kind of sleep sprays and have whole ranges dedicated to helping you switch off so there has to be some truth to them! I would definitely like to purchase the full size of this when my mini's run out as I've really enjoyed using them and love the smell of lavender.